Yap is a cluster of islands that stretch for 600 miles in the vast Pacific Ocean. 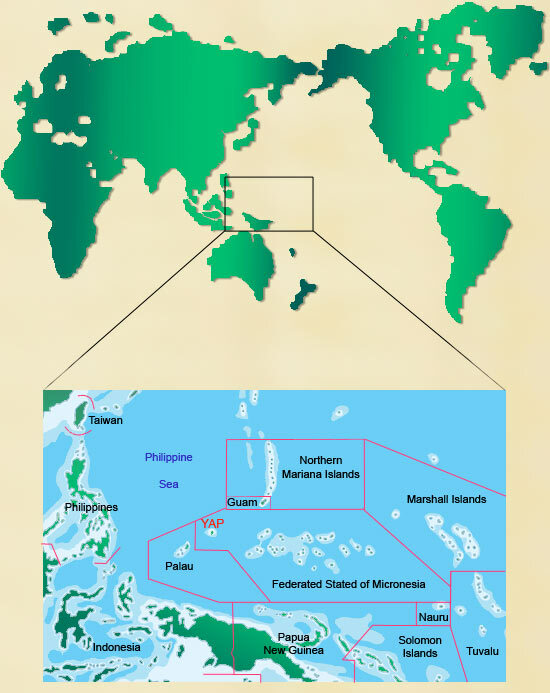 Yap proper, a group of four main islands within a barrier reef, is approximately 500 miles southwest of Guam, 300 miles northeast of Palau, and 800 miles due east of Cebu, Philippines. The other islands that comprise the state of Yap extend eastward towards Chuuk, with one atoll about 80 miles to the south. Yap lies just nine degrees north of the Equator. Most visitors arrive via United Airlines, with 737 service to Yap three days each week. Flight information can be found on the United Airlines web site. The only other way to arrive is by sailing vessel (privately owned). How should I be prepared to pay for goods and services in Yap? There are three commercial banks in Yap: the Bank of Guam, FSMBank and the Community Ayuw Credit Union. US currency is used. Credit cards are accepted by most hotels and some shops but cash is the commonly used currency. Travelers checks can be cashed at banks that are open Monday to Friday. ATM machines are available at the Bank of Guam and FSM Bank. Most visitors are allowed entry to the FSM as long as they have a valid passport and an onward ticket. U.S. citizens are allowed to stay indefinitely, provided they have a valid passport. Most other nationals are allowed between 14 and 30 days. Please check with your travel agent or email the Yap Visitors Bureau for more information. Is there a departure fee from Yap? There is a departure fee of US $20.00 that is payable in cash upon check-in for your departure flight. Yap’s year round climate is sub-tropical, with average temperatures in the high 80’s (F) to low 90’s during the day, and low 80’s in the evenings. Loose cotton clothing, shorts, t-shirts, sarongs, and sandals for the day, and light slacks/polo shirts for the evening. There is no formal dress in Yap, so dress casual and be comfortable. Women should cover their thighs with loose slacks, long shorts or skirts. While acceptable in western cultures, a woman’s thighs must be covered in Yap. Sunscreens are available at hotels and dive shops, but if you have a particular brand you like, bring your own supply. Hats are worn by just about everybody to keep out the sun, and good sunglasses are essential for boating. What is the best season for diving? Diving is good year round, with the Trade Winds blowing from November to May. During these months, manta dives are done in Mi'il Channel and our reef and wall dives are at the southern end and western side of the island. Boat rides for the reefs can be rough at times, but the diving sites are calm and safe. In the summer months, June through October, manta dives are done in both Mi'il and Goofnuw Channels for the mantas, and all of the reefs around Yap are accessible as the winds cease and the ocean is usually calm. How long should I stay in Yap? With our current flight schedule of three arrivals per week, visitors can stay anywhere from two to seven nights or more. Visits of five to seven days are typical, with some visitors staying three weeks or more. Many divers who come for only a couple of days leave disappointed, having learned once they arrived that they’ll be missing out on some of Micronesia’s best diving and cultural activities. Is there beach diving in Yap? No, the reef is too far from land to make any beach dives. Where is the nearest Recompression Chamber, and who is in charge of it? Yap has its own recompression facility, owned by the Yap State Health Department, located at the hospital in Colonia, and operated by volunteers from both the hospital and the diving community. Is Yap a place to bring the whole family? Absolutely! Bringing your family to Yap is a wonderful experience for children and parents alike. There are several taxi companies. Typical fares are US$1.00 anywhere in Colonia and about US$12.00 to the farthest point of the island. It’s a good idea to ask your hotel or service operator to make an arrangement for a taxi because there are no taxis looking for customers on the street and taxis do not have fare meters. There are public buses for US$1.00 that operate each morning and evening only, bringing people to work and back home again at the end of the school and work day. Rental cars vary in price from about US$38.00 to $60.00 per day. I have heard about Yap's intact culture, and I don't want to offend anyone. What should I wear or do when visiting the villages? Women should cover their thighs when in public places. Long shorts or skirts (down to the knee) or sarongs are fine, as are jeans or slacks. Men should also not wear shorts that are “too short”. Bathing suits should be used for swimming or on the boat or at poolside only. What time zone is Yap in? Yap is GMT + 10 hrs. We are ten hours ahead of London, 15 hours ahead of the U.S. East Coast, and one hour ahead of Tokyo. We are in the same time zone as Sydney, Australia and Guam. Yap does not observe Daylight Savings Time. What kind of hotels are there on Yap? Remarkably, there is a wide variety of different hotels on Yap. Every hotel has its own niche that is clearly defined, such as Diving, Eco-tourism, Business, Historic Inn, Resort, Beach, and Economy Hotel. Always ask for permission before entering private property or taking a picture of people. Please note that 99% of Yap is privately owned. Drive slowly in residential areas, especially in villages. Feel free to try out local practices and/or attire, after asking for permission. It helps when Yapese know you’re genuinely interested. Sit properly. For women, don’t squat in public. It’s improper and disrespectful. Learn how to say “Sirow” and “Kammagar” meaning “Excuse me” and “Thank you” respectively. Walk around in public in transparent or skimpy attire. Yapese culture requires women to cover their thighs. Women can wear clothing with hemlines reaching to just above the knees. Step or walk over people or their baskets when they are sitting down. It’s disrespectful. Cause too much noise in residential areas, especially when in a village. Walk around villages empty handed. It shows you’re visiting an area without a purpose and therefore are likely to cause trouble. A small branch (Muteelpaaq) would do if you don’t have a handbag. Walk around at night without carrying a light, especially in the village. It means you are looking to cause trouble. If you whisper, people will strain their ears to listen but if you shout people will shut their ears in annoyance… meaning: Don’t be loud and obnoxious but humble and modest… people will respond better to you that way.